Mornings can be a difficult time for many people to get up and going. 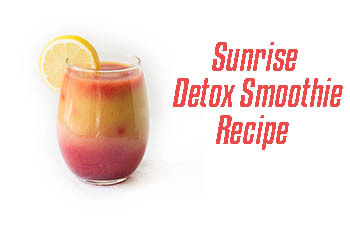 If you’re one of those who needs a small boost in the morning (and prefer to stay away from coffee) then consider trying the sunrise detox smoothie. This yummy blend of banana, mango, raspberries and pineapple tastes just as good as it looks! Sipping on this fruit smoothie each day might just take you to a tropical island where the sun is warm, sand is between your toes and the ocean breeze is brushing up against your face. It really is paradise in a glass! 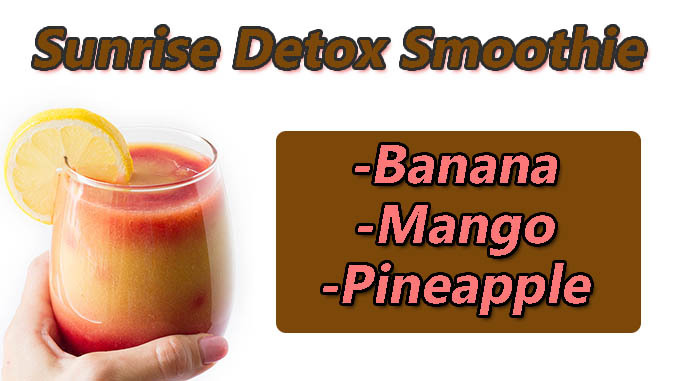 Gather all required ingredients listed below to make this tasty sunrise detox smoothie recipe at home. It only takes about 5 minutes to prepare and serves 1. 1) Place ingredients into a high speed blender and blend until smooth. 2) To get the gradient colors inside the photos just blend the raspberries and other fruit separately. Then, pour in layers to create the effect. Keep in mind, the recipe above uses frozen fruit because it gives the smoothie a better consistency as opposed to fresh fruit. But, you can also use fresh fruit if you desire. While the sunrise detox smoothie tastes great in the morning, this smoothie is actually great anytime of the delay and especially when you’re looking to give your body a little boost. Try it at home and share the recipe with your friends!